Thanks Bob! I see what I can do. I can't let things alone so I made tonight (when one had some time off from the little one) a new smokebox hatch. The drawing was not much good here either. I mostly went for how it looks on the photo. I wish I had payed much more attention in the beginning. I was a bit to convinced that the Sunset model was mostly as built. 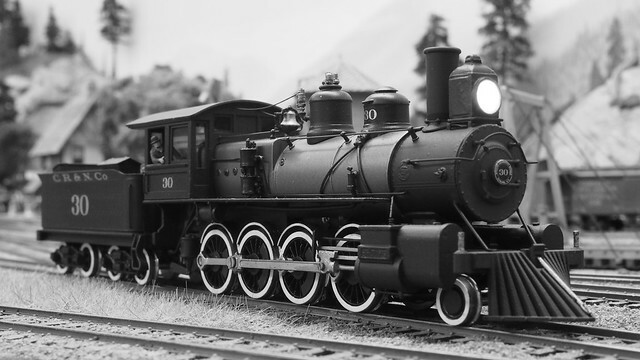 As of now it seems like its a model of a much altered loco. That's a much better smoke box front. Should be a fine upgrade. The air pump in the prototype picture is a NY Duplex. PSC #3078. And for the info on the pump. I�ll keep the single one though. My RR specified a single one:-). I need to stop now this starts too much to be a rivet counter exercise. It has been ages since I posted some updates but today is the day. I start by showing a photo of our very relaxed cat Molly with the message for you to try taking it easy with Christmas coming closer. 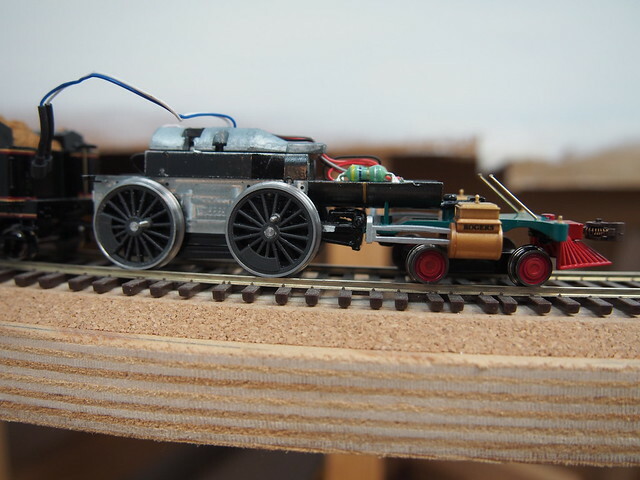 Last time I posted I made some last changes to my F-1 project adding a new pilot with the correct amount of staves together with a new smokebox door. Here are some photos after the changes. I think the change of the smokebox door made it look much more like the prototype. 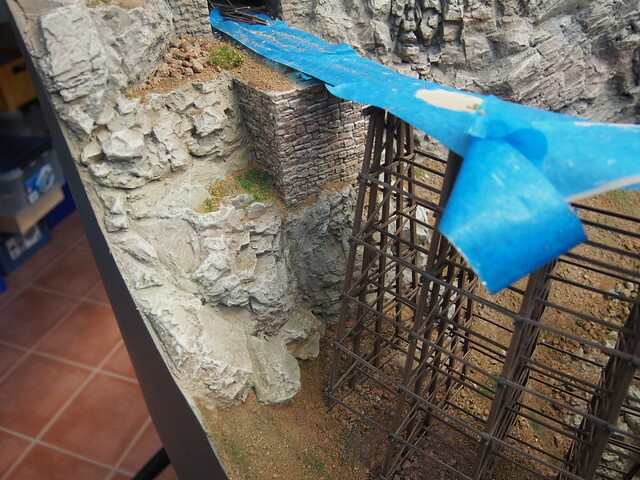 At last I have had some progress on the scenery. 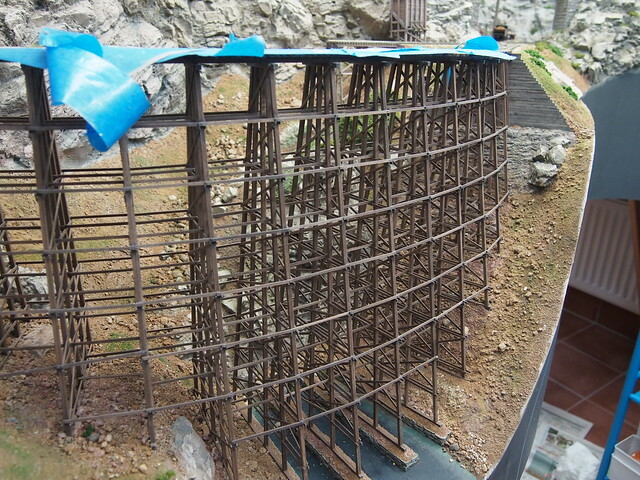 I have using bits of time here and there managed to nearly complete the gorge trestle area. There is some more stuff to do though as adding water, greenery, shrubbery etc. 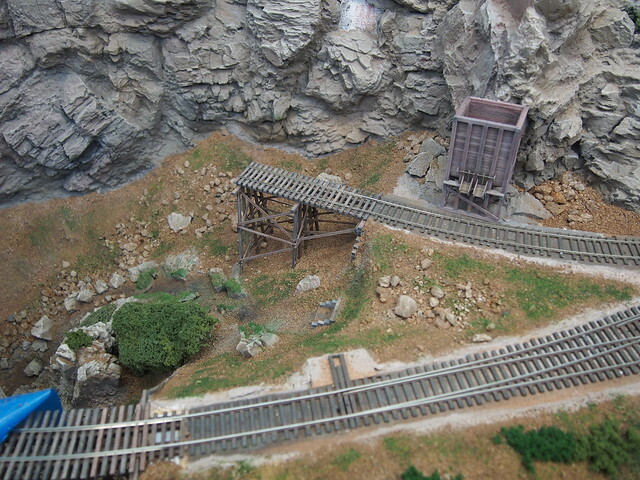 After the scenery is done I�ll start on the mine. You can see on one of the pictures the mine chute. It is way too low so I have to change it adding longer legs and raising the ground. From that the mine rails will lead to a raised platform in front of the mine opening (you can see it as a blind spot in the rock face). 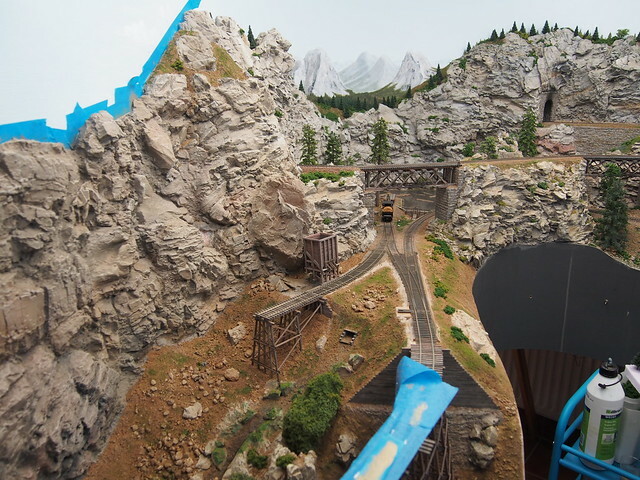 The idea is to make the scenery first to get the impression (hopefully) that the mine actually came after the scenery. The mine entrance can be see as a white spot at the top of the photo. Santa came with an early Xmas present some weeks ago in the form of a metal mini lathe. I first bought a Proxxon FD 150 which proved way too small for my purposes so I sold it and instead bought a larger Sieg SC2 lathe. On this I have been trying to make my own 60� drivers. The prototype comes from a Baldwin drawing. Apart from the center which is 3D printed by Shapeways and the crank pin which is from the English manufacturer Alan Gibson all is made on the lathe from mild steel. I found in Germany a cutting steel shaped for RP25 110 profile which I used to make the profile on the tire. To be able to mount everything together some careful machining had to be done. The center hole on the 3D printed center was carefully reamed out to take a 2mm axle. The center was then turned down to make a snug fit for the tire rim. The tire was then permanently adhered to the center by some thin CA glue letting it wick between the tire and center. The whole wheel was then put in the lathe for a final turning to make sure it the wheel rim was completely centric with the rotation before mounting it to the axle. The axle was turned to a diameter of 3mm with the ends 2mm to fit in Bachmanns 4-4-0 chassie. 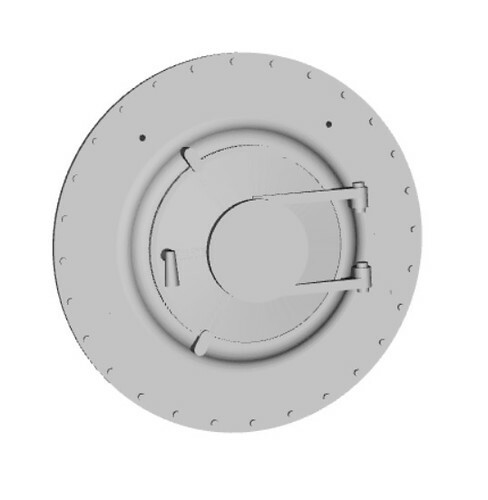 This shows the wheels mounted on the chassi of a Bachmann 4-4-0. The next is to test fit the rods and see that the wheels turn smoothly together. Merry Christmas, H�kan, and welcome back! Beautiful locomotive and scenery, H�kan. Thanks for the update. It's going to be interesting to see what else you can do with your new toy. Good to hear from you H�kan! That's a cool lathe....and the mountain looks great! Those drivers turned out very good, H�kan! And the other changes did too. Merry Christmas! 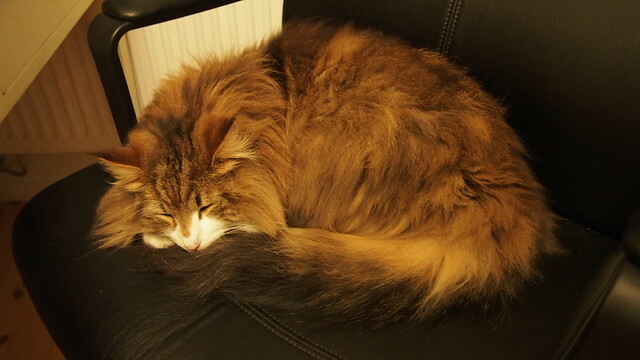 Hi H�kan, your cat Molly looks like she has settled in for a long winter's nap. Your reworked F-1 is beautiful, real nice photos of it. 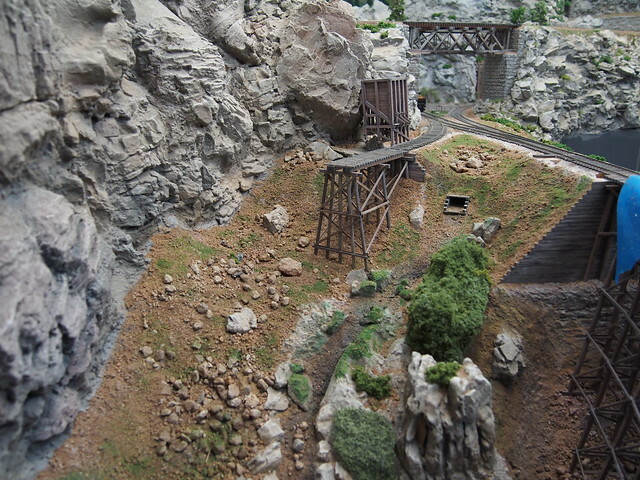 The mine in the mountains, will be another point of interest on your layout. And that new lathe from Santa looks like someone has had a very good Christmas already! Just came back home from seeing The Last Jedi. Fun is that the second generation (my 11 year old son) can be as fascinated by the SW movies as I was when I saw the first one (no 4) with my brother back in 77. Thanks Mike, I hope I can say back with a vengeance but that is to have too high hopes. Thank you George and Carl for the kind words! The lathe is fun toy nearly a hobby in itself. Youtube has been a real boon. 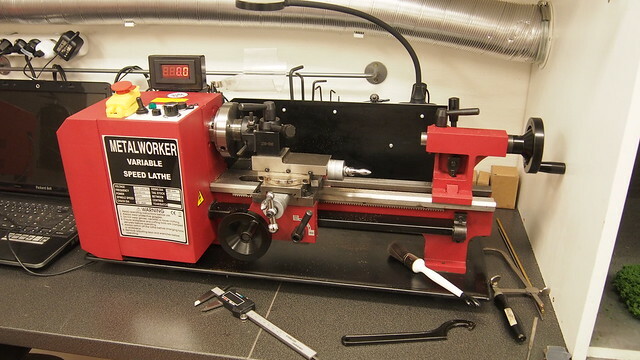 As a newcomer to lathes I have had a lot of help various movies there. For example I had trouble sticking of a piece of material. The steel would not cut very well and the machine shaked. Got the tip that although quite sturdy the machine wasn�t sturdy enough for this and the best way was to put the cutting tool upside down and run the machine on reverse. Worked like a charm. Thanks Bill I�m happy you like the drivers. It has been quite a learning curve and I�m not yet over the top. I used Shapeways high def. acrylate material that isn�t very strong but has good detail. I would have preferred to use their new nylon material that is very much stronger but samples of that was not detailed enough. It would have been better to use the nylon as it would have given me a tighter fit between axle, rim and center. As it is now I have to rely on CA glue as a tighter fit will break the high def. acrylate. Ohh she is very lazy now during winter. And a very snobby cat. One could think with the first snow and Norwegian she is that she would enjoy the snow but when she gets out she follow the house wall where the roof overhang keeps it snow free around the house then she comes back in again. And lie down to nap once again. And thank you for the kind words Greg. I can�t keep up with you all on modeling but I�ll try. I have given myself a promise to be in this years challenge. See how that goes. So good to see you posting again, Hakan. I always enjoy your updates. On turning using a lathe: Always set your cutting tool just a bit below center in regards to direction of rotation. In other words, looking at the front of the lathe, if the piece to be cut is turning COUNTER CLOCKWISE, then your cutting tool should be set BELOW the 9 PM position. This will reduce "chatter" and eliminate the possibility of the tool biting too hard and causing severe chatter, or worse, damage the cutting tool and possibly the tool holder as well. The driver tires you've turned look GREAT! Thanks for the tip Andre! I'll try that. Glad you like the drivers! A tiny update near the New Year. I suddenly found the gorge area to be quite fun to work on. I haven't felt like that for the last year mostly dreading working with it. But now that it nears completion it is fun again. Yay! 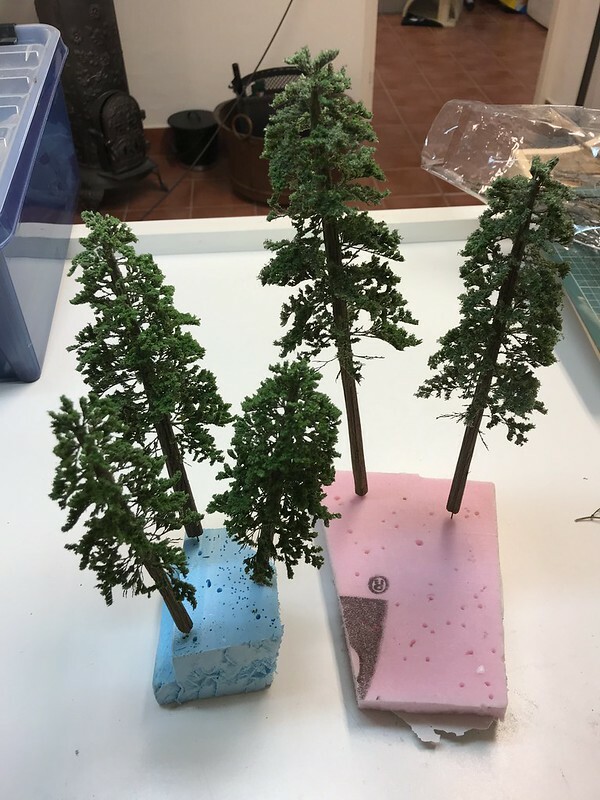 I made yesterday five pine trees with the Jack Works method evening after the little one had gone to sleep. They will be planted in the Gorge to somewhat diminish my rock wall. H�kan that mine scene is beautiful. Wonderful rock work and coloring.